Each person has an interest in creating sustainability – employees, guests, customers, vendors, but especially future generations who need the earth to live on and to live from. The growth of prosperity and rapid changes from the agrarian era to industrialization, mobility and ICT has turned our world upside down for over 100 years. Billions of people in the world use countless resources to achieve and maintain our current welfare state. The demographic outlook is that we will have a population of about 10 billion people by the year 2050. The population in countries on the continents of Africa, Asia and South America need more wealth. Medical and biomedical developments will lead to longer lives and lower infant mortality. We do not have enough raw materials, food and especially water necessary for this ‘explosion of humanity. We will therefore collectively need to deal more efficiently with what we have: energy, water, wood / forest, and a certain political and military stability worldwide. The transportation sector: transfers guests who often travel by car, while international guests use taxis and buses. Not forgetting of course that everything we consume is either used or transported to and from these three industries. 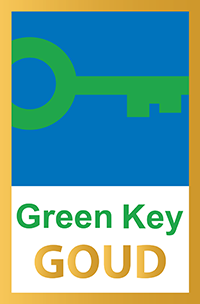 With the golden Green Key sustainability certificate, we demonstrate that we actively contribute to sustainability. We not only focus on the environment, energy and CO2 emissions, but corporate social responsibility in a much broader context. The objective of the Kontakt der Kontinenten foundation is to involve people in worldwide issues, making them more aware of their global citizenship and stimulating them to contribute to a sustainable and more just society. Kontakt der Kontinenten Training & Consultancy organizes training courses, conferences and functions with a truly worldwide identity. With our contribution to waterprojects from FairWater.org and JointhePipe.org we help to protect the environment and to provide people in third world countries with clean drinking water. We want to create awareness among our guests and associates by making the necessary information available in our hotel rooms and on our website, and by clearly stating our Corporate Social Responsibility objectives in our presentations to (potential) customers.